Eva had a few dollars she was hesitant to spend and I found her drooling over the Curious George section at our local Barnes & Noble. "Here, Pookie," she slapped a few down on my lap, "Read these to me, I need to see if I like them enough to buy them"
Eva curled up in my lap and I began, "He was a good little monkey and always very curious." Several books later, my legs shifted & Eva laid out flat, "He poured in some soap. First a little, then a little more, then the whole box. He pushed the handle and the machine started to wash. Suds began to float right out of the machine and over the top! Soon, suds were everywhere!" And awhile later, my shoes tossed beside me, Eva's thumb in her mouth, "But instead of going into the pen, the ink spilled all over and made a big blue puddle on the floor. It was an awful mess." You can now celebrate H.A. Rey's birthday as "Curious Day." He was born in Hamburg, Germany, September 16, 1898. His wife, Margaret, co-writer, was born in May, 1906. It just amazes me that kids are still huge fans. They wrote a fictional book in the early 30's that included a monkey named George and soon they began thinking George should have some books all his own. Being Jewish, the Reys' work was interrupted when they had to flee the Nazis, which they did by bike, by the way. And thus they eventually found themselves in New York City in the 1940's with Houghton Mifflin publishing their Curious George in 1941. The Reys have passed on now, but George continues to live young and very curious. 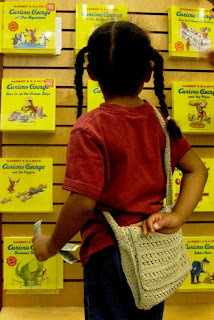 I love Curious George and it's been a lot of fun to introduce my kids to him and now my grandchild. No other juvenile fictional character..... well.... except Snoopy... can hold a candle to George. You said it!! George is the MONKEY!!! Lexie LOVES him & watches him every day! She never tires of the cartoons or the books & George's "Don't feed the animals" has been the book of the week for bedtime! Hooray for George! !